Vegetable stew is a global dish made from a mixture of vegetables like Carrot, potatoes, green peas etc which goes well with pathiri, puri, appam, bread or rice. These ingredients can include any combination of vegetables. The usage of coconut milk as an ingredient gives it a typical Kerala flavor. Slice the vegetables into cubes of 1/2 inches and clean them well. In a deep bottom frying pan, heat the butter or coconut oil. Add the onions to it and saute it till the onions become transparent. When the onions become transparent splutter the crushed spices. Add the ginger, garlic, curry leaves and the green chillies and saute it for a few more minutes. Add the sliced vegetables and saute well. Lower the flame, cover and cook it till vegetables are soft. This will take around ten minutes time. Now add the thick coconut milk (first) and cook for another five more minutes. Remove from stove and transfer it into a serving bowl. Garnish with curry leaves fried in coconut oil or ghee. 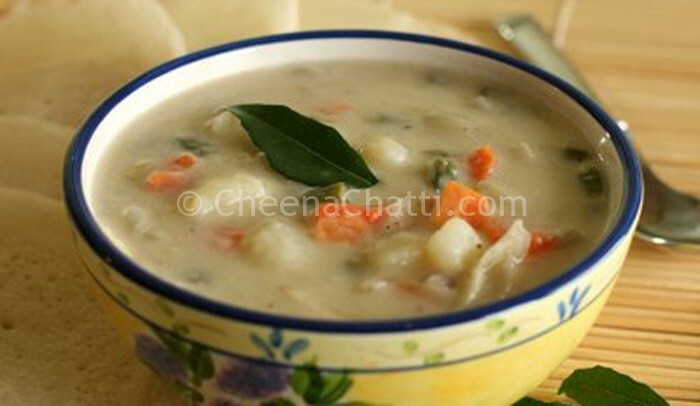 You can serve this vegetable stew with chapathis, pathiris, puris, appams, rice or bread. If you want the gravy to be very thick soak 7-8 pieces of cashew nuts in warm water and grind them into a smooth paste and add it in the last. Mix with the thick coconut milk and add to the stew. This entry was added on May 12th, 2013 by Jameela Beevi in Vegan and tagged with stew, vegetarian, easy vegetable stew, kerala curry, kerala recipes, kerala vegetable stew, how to make vegetable stew, kerala stew, how to make stew.. Last revised on April 4th, 2018. Recipe & Recipe photo contributed by Sherly James. can i add chicken and prawn to this ? @Nishal: as an experiment you can try that. But then it wont become “veg” any more… If you are trying that, please share the final outcome with me. Love this preparation. Thanks for sharing. So no need to add cumin and cardamom to this???? @Sumi: I am using cardamom in step 4. But not using cumin in the veg stew preparation. I tried it and was good. അവിടെ ഉണ്ടാക്കിയതു ഒന്നു പഴ്സലായി അയച്ചു താ. തിന്നു നോക്കട്ടെ, എന്നിട്ടുപറയാം നല്ലതാണോന്നു്! My husband and I loved it. Thanks for the great recipe. Printable version available? @Latha : Thanks for stopping by and trying our recipe. We are so glad to hear that you family loved the recipe. You can get the print version by clicking on the print button on the sidebar. I grew up on a piece of land where my parents always had a small garden of vegetables and Kerala was ever present in most of our meals. We cooked it mostly fried in slices with lots of seasonings and either shrimps or meat pieces or stuffed. Now, I regularly have fruit smoothies with a few slices of kerala added to help my blood sugar spikes. I see a great difference when I use it. Its good for my health as a diabetic. uaually I make bit changes , but this I made exactly like the recepie it was nice. Thank you so much Deepa 🙂 Good to hear that it came out well for you. Thank you, Jameela ji, i will follow your recipe soon. Can you share the recipe of jackfruit payasam, please? Hi. i am Rajesh I like this veg.stew receipe. I like to make different types of recipes and also give it to my friends. They also tasted it & like it.thank you. Thank you Rajesh for trying the recipe and taking time to drop your comments. It turned out to be very tasty thanks. .
@Gita: Thank you for trying the recipe and dropping your valuable feedback.. Glad to know you liked it.